Our traditional Armenian braided string cheese, called also Fine Tresses, Angel Hair or Mshallaleh, is the real Armenian string cheese handmade according to genuine traditions with nigella seeds (also known as black cumin or black caraway). 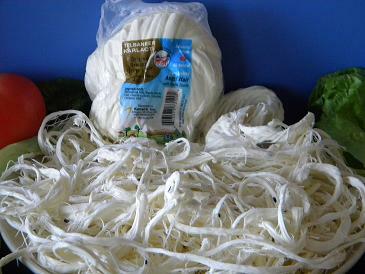 It is fine braided following the traditional Armenian string cheese production methods. Karlacti String Cheese comes in the form of a knotted endless loop of fine string braids due to the way it is hand pulled. You can enjoy it in all seasons. Our delicious real Armenian string cheese, called Mshallaleh by those having Middle Eastern ethnic origin, is produced in USA and Canada following Armenian traditions according to strict quality standards and distributed by KARLACTI, Inc. a US Company. The US string cheese is ready to eat. Just cut it in two parts and disentangle the strings with your fingers. 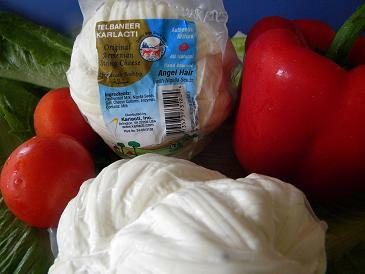 The Canadian version is dryer and saltier as most Mediterranean cheeses to preserve it up to one year. You can enhance its delicate flavor bathing it in water after disentangling the strings. Ara Baghdassarian continues the path drawn by his father, Ohannes Baghdassarian. He preserves the historical Armenian heritage of the Baghdassarian family by producing authentic all natural specialty cheeses, Armenian cheese, Mediterranean cheese, Mideastern cheese, specialty Middle Eastern dairy products and natural cheese and dairy food products.